Inventory We are a resale marketplace, not a box office or venue. Ticket prices may exceed face value. This site is not owned by MidFlorida Credit Union Amphitheatre . The MidFlorida Credit Union Amphitheatre has changed names frequently in the last few years. Formerly the LiveNation Amphitheather, 1-800-ASK-GARY Amphitheatre, and Ford Amphitheatre. 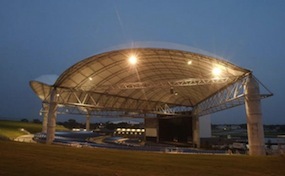 The MidFlorida Credit Union Amphitheatre is an outdoor concert facility, in Tampa, Florida, located on the Florida State Fairgrounds, adjacent to Interstate 4, in the eastern side of town. With a capacity of approximately 20,000, it is the largest outdoor concert-only facility in the Tampa Bay area. Originally named the Ford Amphitheatre, when first opened by The Cure's Curiosa Festival on July 25, 2004, it was renamed the 1-800-ASK-GARY Amphitheatre when the naming rights were purchased by the lawyer referral service for a total of three years, starting on June 10, 2010. The MidFlorida Credit Union Amphitheatre has also recently expanded its suage to political rallies as in the 2016 Presidential Campaign. Each year of exsistence the amphitheater gets better and better. MidFlorida.AmphitheatreTampa.com is not affiliated with any primary box office or supplier. We are a privately owned and operated business specializing in sales in the secondary market. To buy tickets for any Tampa Amphitheater events in Tampa simply click on the event of interest or call our operators at anytime.